Entrepreneurs: Ben Yu and Deven Soni, founders of San Francisco-based Sprayable Energy. Bonding at sea: Yu, who studied molecular and chemical biology at Harvard before joining Peter Thiel's fellowship, and Soni, a venture capitalist, met when they shared a cabin during an entrepreneurs-only expedition to Antarctica in 2011. The duo collaborated on a few projects before developing what they describe as the world's first caffeine-based topical energy spray. 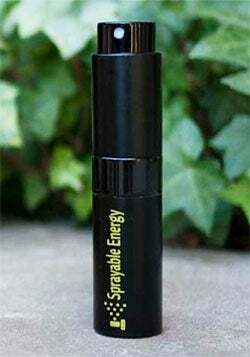 Just a little spritz: "I'm sensitive to caffeine, so I've always wanted to find a way to stay energized without having to drink coffee or energy drinks," says Yu, who gets jittery, then crashes, after drinking a cup of joe. He discussed the idea of sprayable caffeine with his dad, a chemist who studies ways in which substances can be absorbed through the skin. After a year of arduous lab research, Yu and his dad discovered that caffeine's solubility can be increased by adding a simple derivative of the naturally produced amino acid tyrosine, thus allowing it to be used in spray form. The inventors claim that topically applied caffeine offers a consistent level of energy without the jolting buzz-then-crash that can come from drinking caffeinated beverages. They suggest spraying their product on the neck; four squirts offers about the same effect as a cup of coffee. Building buzz: In August 2013, Yu and Soni created an Indiegogo campaign with the hope of raising $15,000 to produce their product. To their surprise, they ended up reaching their goal within 24 hours of posting it on the crowdfunding site, and within 40 days they had raised $169,862. "We were initially worried that this would be a niche product, but we quickly learned just how many people aren't satisfied with the current energy products on the market," Yu says. Cost: The colorless, odorless spray comes packaged in a slim purse- or pocket-size bottle. A two-week supply (40 doses, or 160 sprays) sells for $15 exclusively through Sprayable.co. The goal is to see Sprayable bottles stocked at gas stations and convenience stores. Tireless expansion: Yu is cooking up line extensions, including potentially creating scented versions of the product and offering it in varying concentrations for different energy needs.